Our apologies for this post coming so late to you. 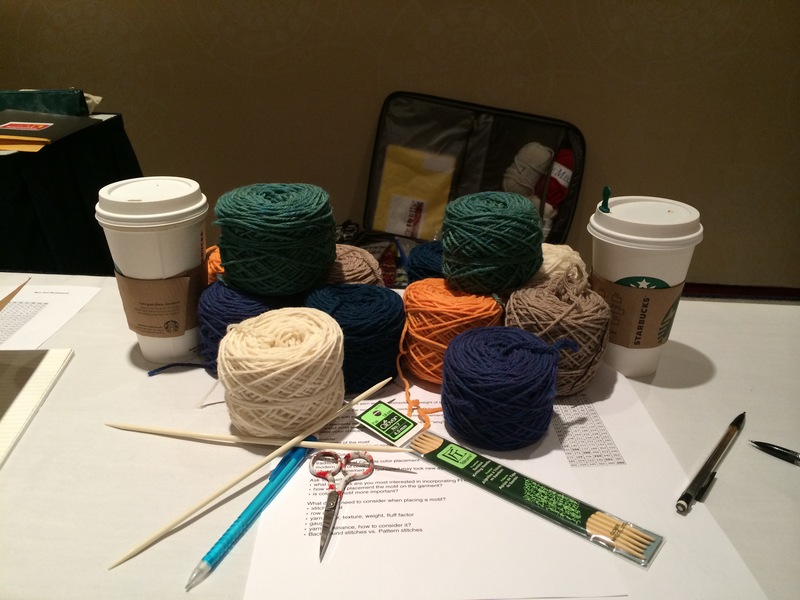 Vogue Knitting Live was over two weeks ago, though that hardly seems possible. Florrie has been chasing her tiny terrors around and I’ve been slogging away at the day job and we have both been knitting feverishly for impending deadlines. So, here it is, better late than never. Our first class was Friday morning. Color work with Mary Jane Mucklestone, who is nothing short of charming and nice, and funny, and TALENTED! Man, this woman can knit. She had a giant suitcase filled with color work swatches. I mean FILLED. They were fascinating and even though this class didn’t have much actual knitting, I really learned a lot. Now I’m not scared to wander down the fair isle path at all. We’re ready to do color work! Coffee is an important supply to have on hand. 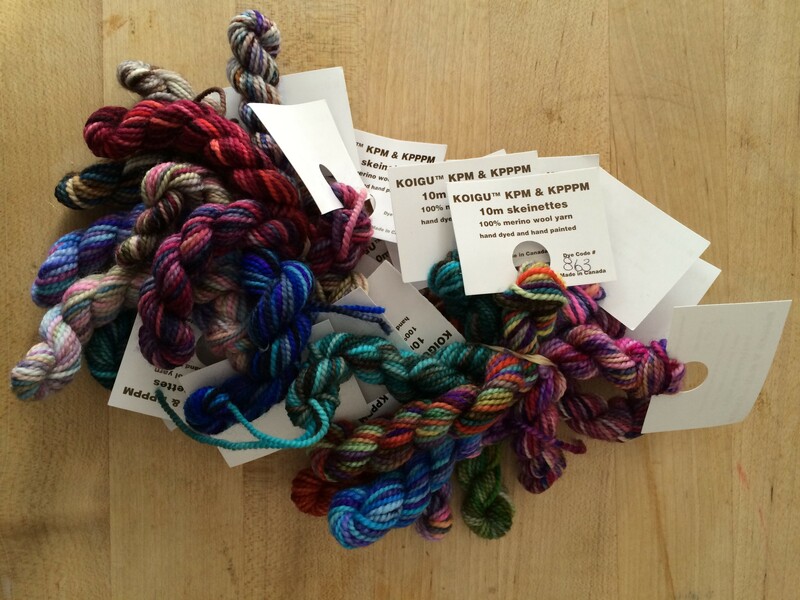 I suspect that we will become color work junkies… its inevitable, I fear. After our first class we had time to wander around the art gallery section of the convention. There was everything from the weird to the wonderful. One of our favorites was the needle felted Gnome Chess Set by sisters Jennifer and Melissa VanSant. So cute and funny. I’ve always loved gnomes.They are such silly creatures. 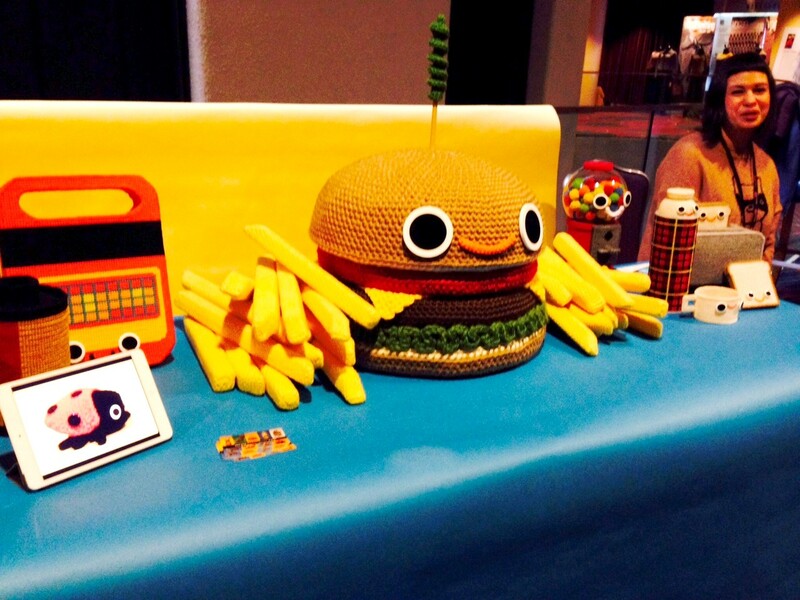 Another wonderful bit of woolly art was the hilarious crochet of Nicole Gastonbury. Super creative and so funny! Aren’t the expressions she creates just so spot on? Don’t even get me started on those giant french fries. The little plaid thermos was my favorite I think. I wanted to take him camping. 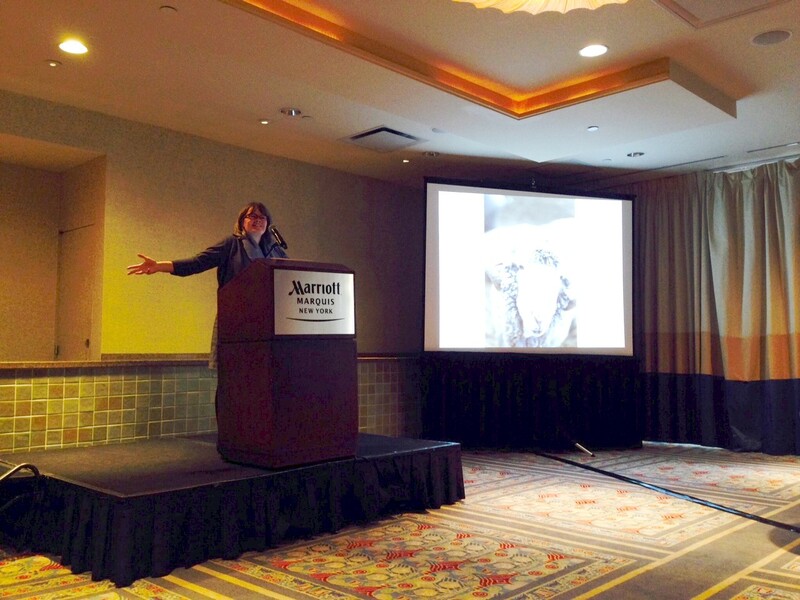 Later that afternoon went to Clara Parkes lecture ‘Journey into the Great White Bale’. Check out her blog for more on this crazy adventure. Florrie had gotten me Clara’s book The Yarn Whisperer as a Christmas gift and Clara graciously signed my copy. Its truly fascinating. She was another one that is charming and funny and we didn’t want the lecture to end. I knew it was going to be fun to meet knitting women that we have admired, but what I think was the most unexpected was how accessible they were. Friendly and helpful and even handing out phone numbers and email addresses with promises to answer further questions. After the lecture we asked Clara if she thought it was worth it to get into wool processing to produce yarns for hand knitting, fully expecting a lukewarm, maybe. What we got instead was a whole hearted YES! Such enthusiasm is contagious and we left bolstered and more excited than ever. She was pretty awesome. 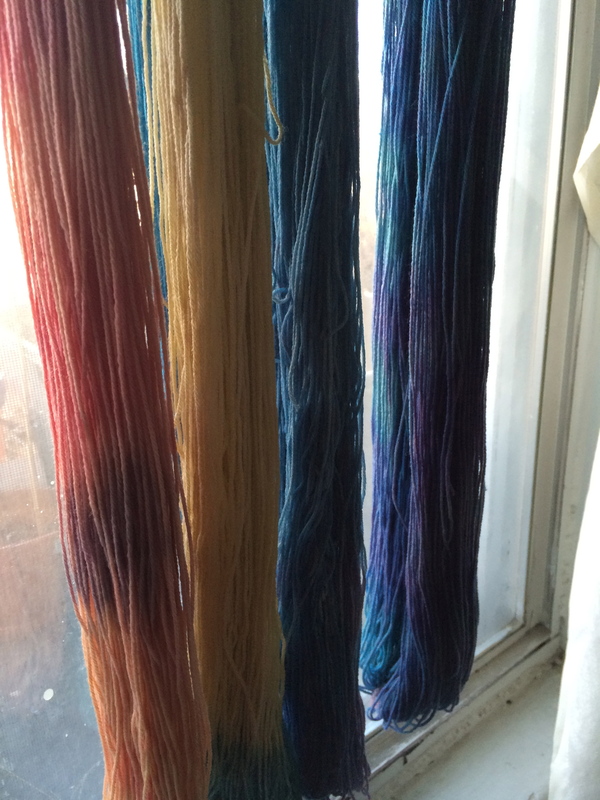 Clara shows us how different each of the yarns were. Day two began bright and early with, you guessed it. Coffee. 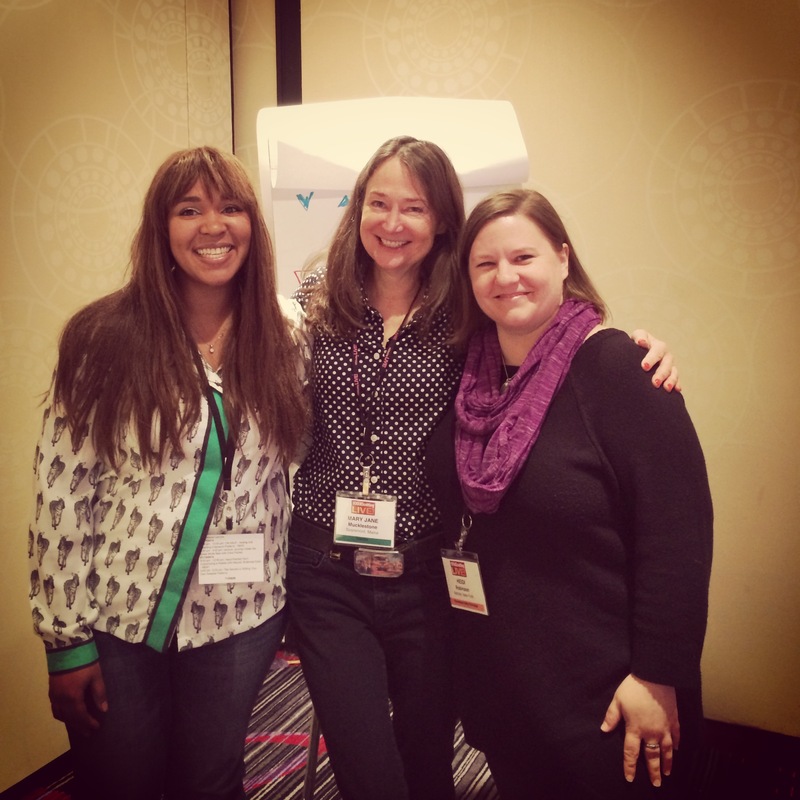 After fueling up on caffeine we headed down to the hotel to Rhonda Faginoli’s natural dying class. 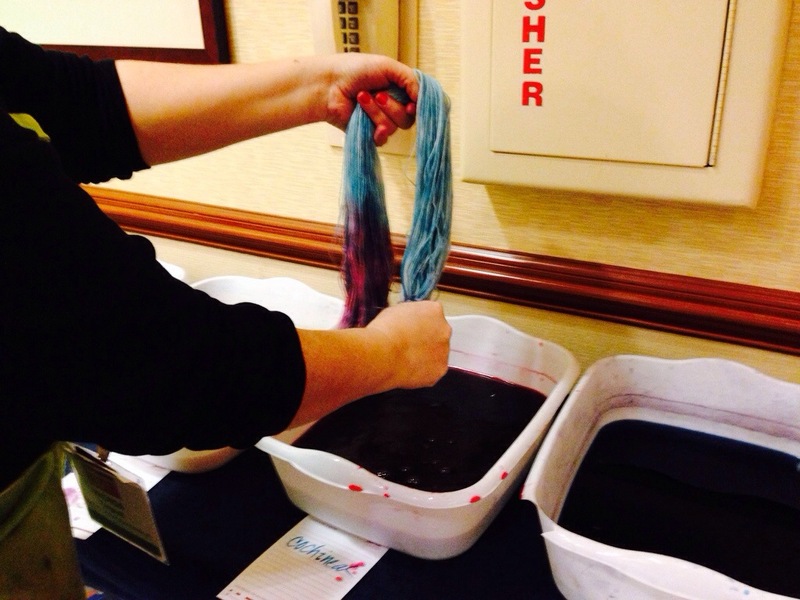 We used indigo, cochineal, madder root, and other botanicals to dye two skeins of wool each. 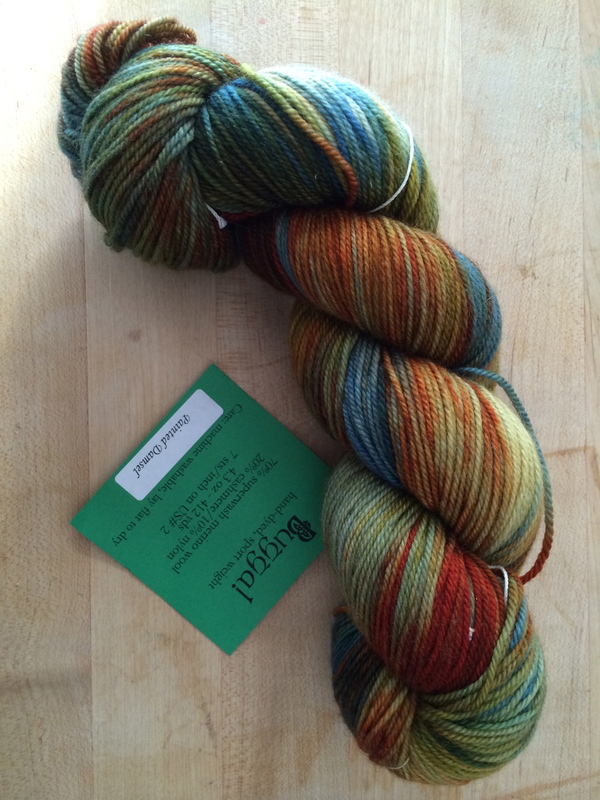 It was fun, the wool was sock weight and each skein was a decent size. 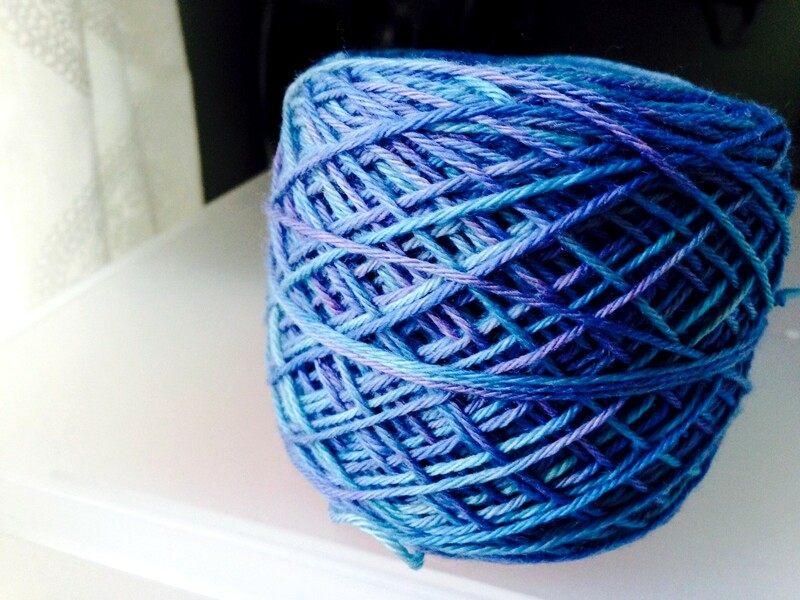 I would have preferred DK or Worsted, but it was till fun. 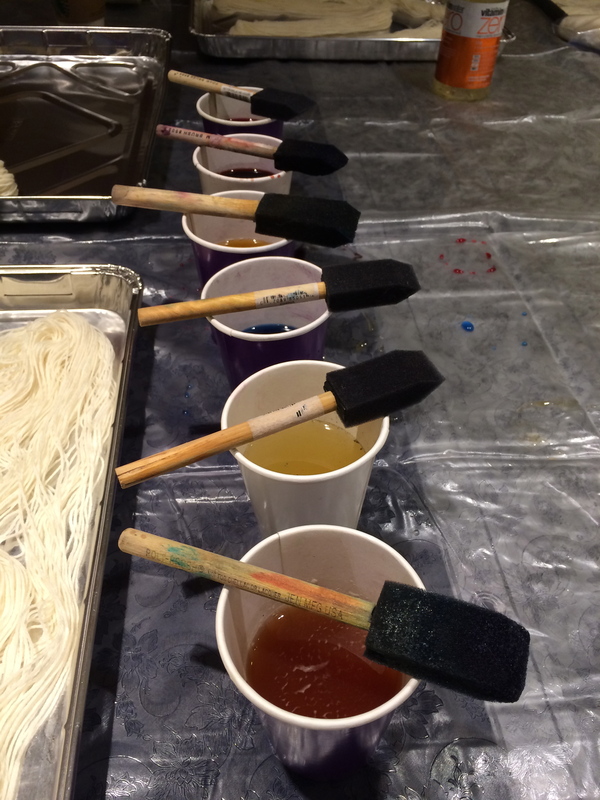 We started out painting with the dye using foam brushes to get a base color going. I’m not going to lie, there were quite a few nervous faces at this stage in the dying game. The base colors were bright and frankly a bit alarming. 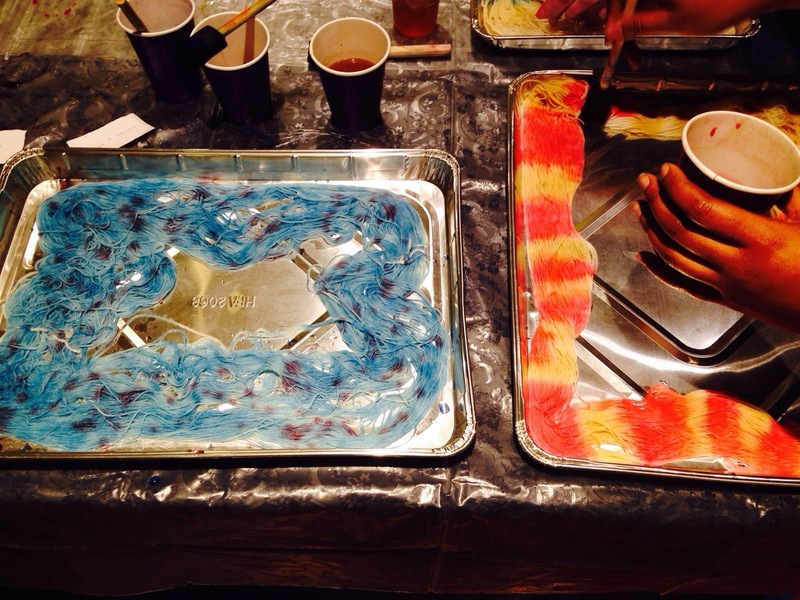 But we soldiered on until we were ready for the final stage, the dip dye. 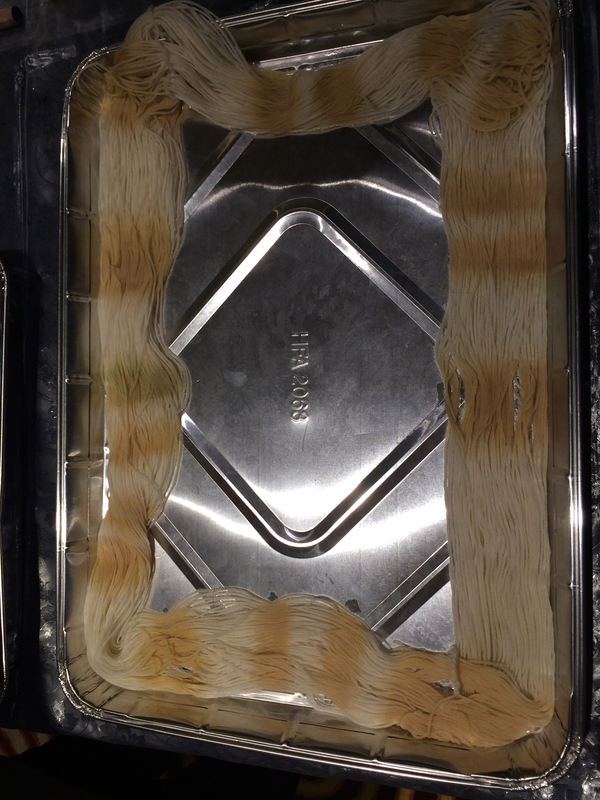 After drying and winding the wool. 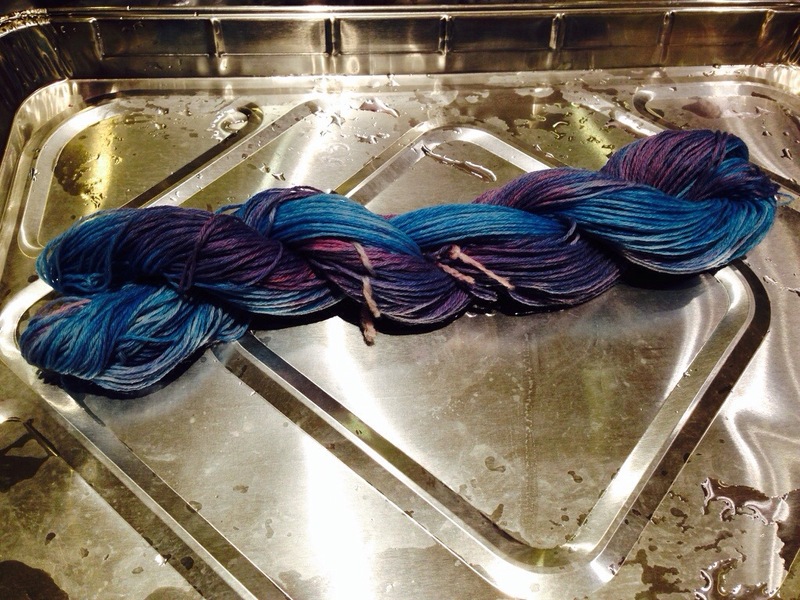 The color has mellowed a bit after drying, as color is going to do. But the blend is very pretty. 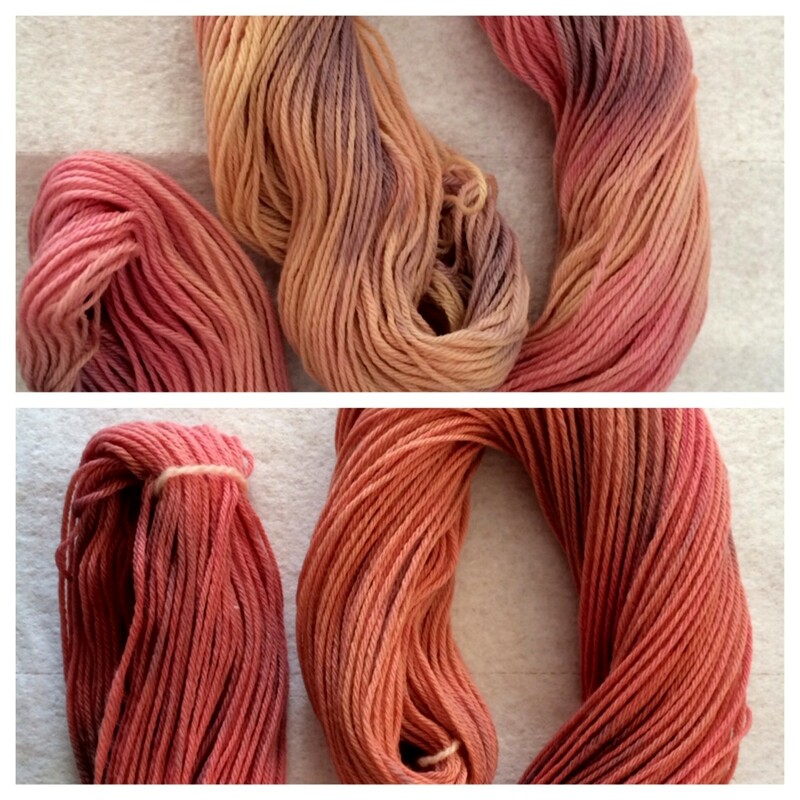 Florrie wanted her red wool to go even darker, so she kept it damp until she got home and over dyed it with beets to bring out the red. The before picture is on top, the bottom is after. Isn’t that lovely? She may do a post about the process in the near future. I want to read that! We had a few hours to kill before the next and last class of the day, so we wandered through the Marketplace. 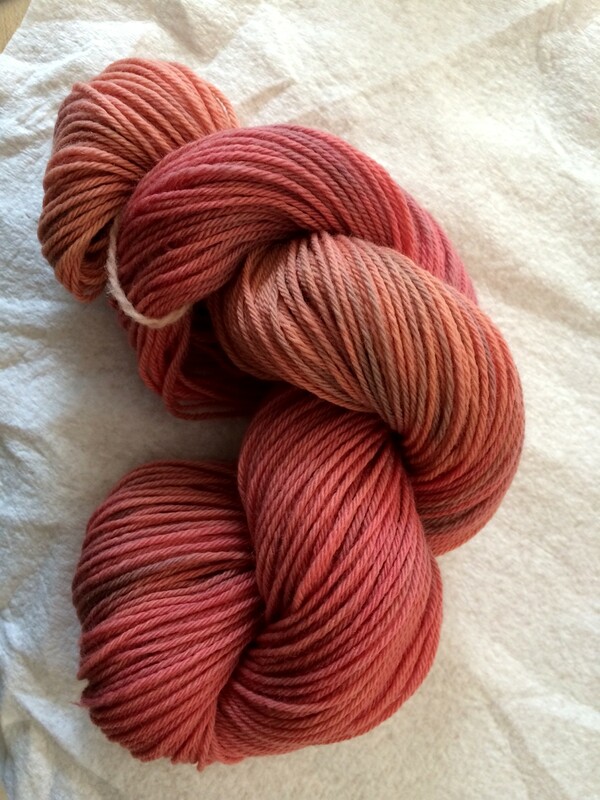 I had to laugh because Florrie didn’t make it 100 feet into the first room before finding this gorgeous gem of a skein from the Sanguine Gryphon. I KNOW!! I can’t even stand how pretty this is. The marketplace was packed, as usual, but we squeezed our way through. I ran into a friend of mine, Helga and chatted for a bit. I think I may have even seen my down the block neighbor, random! Florrie also scored big time with this bag of Koigu skeinettes. Ahhhhhh! 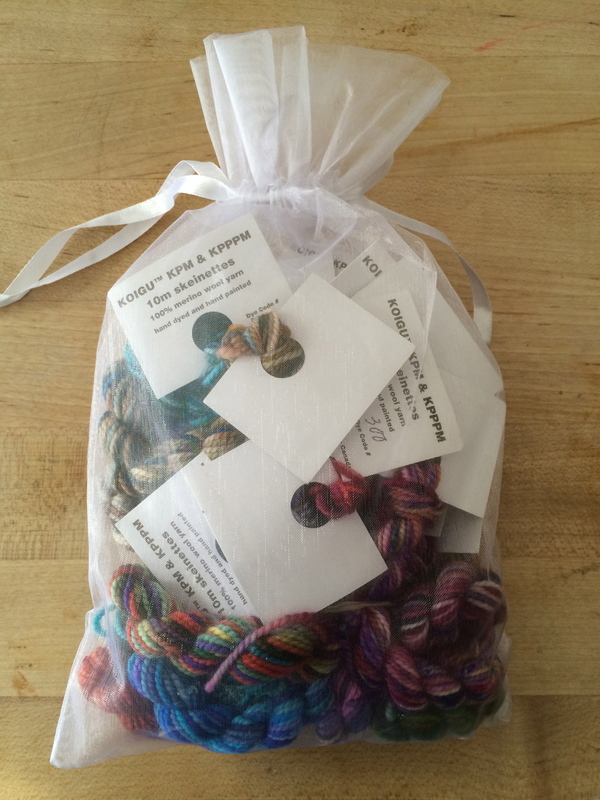 that’s a bag full of KPPPM magic. All that for $20! I’m kicking myself that I didn’t buy one too. Love love love. 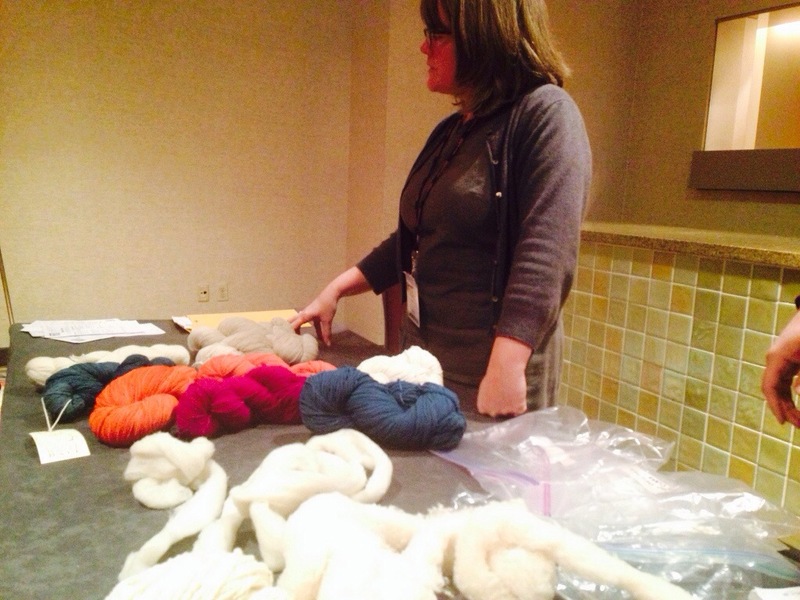 Our last class of the day was Sweater Design with Leslye Solomon of Woolstock Yarn shop in Baltimore. I realized that we were so into our graph paper that we didn’t snap any pictures! Leslye was funny and quirky and we really enjoyed her class. I felt like it really could have been a two segment 6 hour class, but we were happy with what we learned. We bought this very clever graph paper that she designed specifically for sweater design. Its very cool! Keep an eye out for sweater design from Florrie and Marie! Whew! What a great weekend! Vogue Knitting Live is a bit pricey, and we were worried that it wouldn’t live up to our expectations, but it was so much fun. I want to take even more classes next year. You should see if there’s one happening near you!